This item is expected to ship 4-6 weeks after the event on July 24, 2019. If you aren’t asking about your clients’ sleep, you’re making mistakes as a clinician. All clinicians should know how to properly assess and treat insomnia – sleep is that important for your clients’ health and quality of life. It’s no secret that insomnia frequently develops as a result of PTSD, anxiety, depression, chronic pain, and a wider variety of other behavioral and medical disorders. Traditional wisdom has been that if you treat the primary disorder, the insomnia will go away. However, the data does not support this traditional wisdom. Although the primary disorder improves somewhat, the insomnia often does not, which can lead to diminished improvements in clinical outcomes regarding the primary disorder, increased dropout rate and higher relapse rates. Despite you doing everything you can to target the primary disorder, your client continues to be tired and struggles more with symptoms of the primary disorder, leaving you frustrated and overwhelmed because you don’t know what to do next. The truth is, when clients have PTSD, anxiety, depression, or chronic pain, their symptoms are made worse --- and treatment more difficult --- when they’re not able to sleep. Therefore, the insomnia must be targeted directly. Improve clinical outcomes in clients by integrating the treatment of insomnia into your practice! 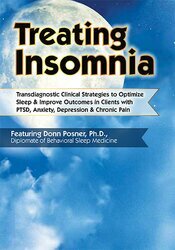 In this recording, Diplomate in Behavioral Sleep Medicine Donn Posner, Ph.D., walks you step-by-step through the treatment of insomnia. You’ll learn how to properly assess and develop a treatment plan for insomnia, as well as how to educate your clients about sleep to make them experts on their own sleep disorders. Discover evidence-based strategies to help your clients sleep longer and more efficiently, as well as enjoy increased energy levels during the day. As a result, your clients’ symptoms of PTSD, anxiety, depression, and chronic pain will decrease in frequency and severity. You’ll walk away from this recording with the tools you need to treat insomnia. Better still, you’ll add vital techniques to your clinical tool kit that you didn’t know were missing. Learn how to treat insomnia and revolutionize your treatment outcomes! Summarize the basics of sleep nomenclature including sleep period, phase, continuity, and architecture to inform clinical treatment interventions. Conduct a clinical assessment to differentiate acute insomnia from insomnia disorder in clients and articulate the importance of treating the chronic form as a specifically targeted co-morbidity. Explore the empirical evidence for the efficacy of CBT-I for both primary and co-morbid insomnia disorder to inform the clinician’s choice of treatment interventions. Articulate the basics of sleep regulation and demonstrate how to utilize these concepts in the deployment of CBT-I in clinical practice. Identify how to obtain useable client sleep diary data and strategies for analyzing the data for use in the treatment of insomnia. Apply the techniques of stimulus control, sleep restriction, sleep hygiene education and cognitive therapeutic strategies to the clinical treatment of chronic insomnia. Donn Posner, PhD, certified behavioral sleep medicine specialist, is an adjunct clinical associate professor in the Department of Psychiatry and Behavioral Sciences at the Stanford University School of Medicine. He is working as a clinical/research psychologist at the Palo Alto VA. Prior to his role at the VA, he spent 25 years serving as the director of clinical behavioral medicine for Rhode Island and Miriam hospitals and was also the director of behavioral sleep medicine for the Sleep Disorders Center of Lifespan Hospitals. For 20 of those years, Dr. Posner served as the primary supervisor for a rotation of the behavioral medicine track of the clinical psychology internship at Brown. He also mentored post-doctoral fellows and lectured on behavioral sleep medicine and anxiety disorders to interns, fellows, and residents in internal medicine and psychiatry. In addition, he was a consultant for the Veteran’s Administration roll out of CBT-I and trained VA clinicians across the country in the implementation of this treatment.